Some heathen disambiguation. And something called the Grand Narrative! Thanks for reading! See ya Wed for a jump to a couple of little rascals. 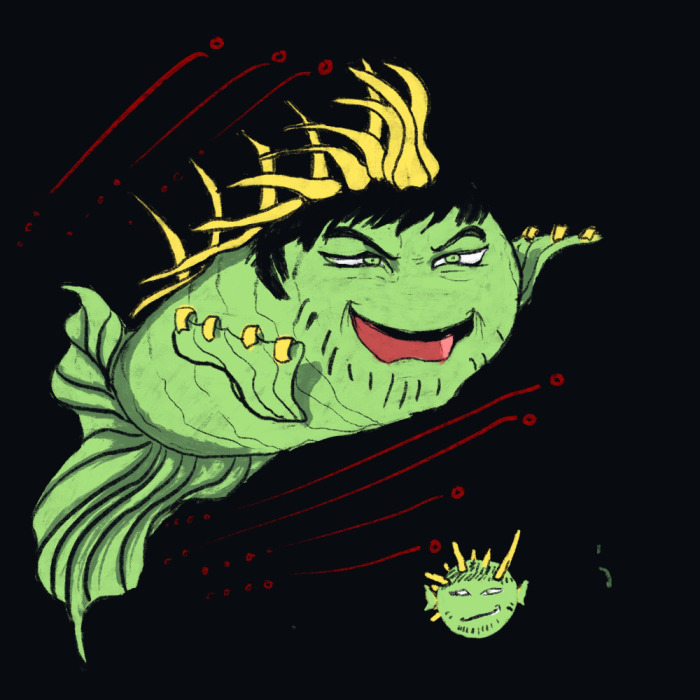 I put Lin up for sacrifice in a thread and the best thing in the deep blue sea was produce XD. Thanks ratt! It's just the diary of some guy named "Grand", I'd assume. ...I confess the reason I started this comic was to pull that twist about Grand's diary, well snap it all lmao! I love how he’s so happy all the time ^^, even though he’s pure evil ^^; . Thats really interesting . One thing I like aboiut this story are all the turns. I might have to reread but this ‘Grand Narrative’ hasn’t been mentioned before? Thanks! I'm glad I wanted this to be a really full of crazy turns story haha. And yes actually, The Grand Narrative was alluded to VERY brieifly on a panel when Rabidus was talking to Pintar on the plane. I'll have to find it! The key to immortality have just been unleashed. I'm glad I was able to see this moment. And I'm honored that you're glad to witness this moment man ! It was fun to write. this man meph is crazy he wants to be immortal wuts the book do?? But more seriously, I do wonder what that grand narrative actually does, how it works. An actual story, or a potential inside-one's mind story (such as the meta narratives)? What secrets it's going to reveal? Ah yes, the grand narrative is one of the crazier things in this story! And you might be on the track with it's relation to the meta narratives we've already been introduced too, but at the same time I can say it's nothing like anything introduced lol. I can say it'll be revealed slowly but we'll get a glimpse at it's power before the end of the chapter :). Heyy penguinx :D , glad you caught up again! And ...you know what that might be a slightly accurate analogy..kinda haha (+10 for griff). /does he have to say "Klaatu, Baratta, Nicto! in order to use it? I didn't think someone would figure out the keywords so fast lol. Glad that answered a pertinent question of yours :D.
This page was a surprise. I didn't expect to see Meph right away again.